The finest quality Star Anise. Star anise is grown in four provinces in China and harvested between March and May. Its also found in the south of New South Wales. The shikimic acid is extracted from the seeds in a ten-stage manufacturing process which takes a year. Reports say 90% of the harvest is already used by the Swiss pharmaceutical manufacturer Roche in making Tamiflu but other reports say there is an abundance of the spice in the main regions - Fujian Guangdong Guangxi and Yunnan. Star anise contains anethole the same ingredient which gives the unrelated anise its flavour. Recently star anise has come into use in the West as a less expensive substitute for anise in baking as well as in liquor production most distinctively in the production of the liquor Galliano. It is an ideal flavouring for roast chicken and also goes well with braised fish and scallops. It is often used in clear soups and you should try adding it to leeks and pumpkins when you next cook these vegetables. 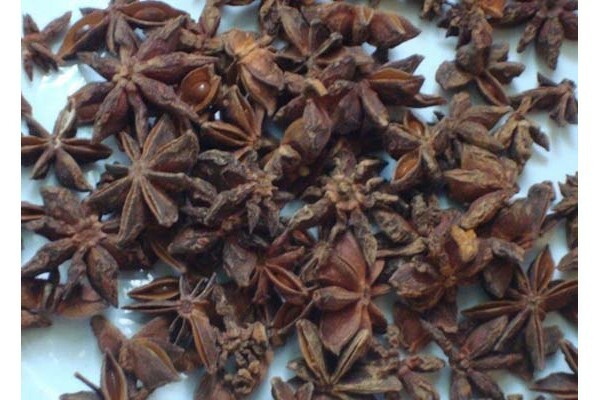 Star Anise is widely used in Chinese cuisine and Indian cuisine where it is a major component of garam masala and in Malay-Indonesian cuisine. Star anise is an ingredient of the traditional five-spice powder of Chinese cooking. It is also a major ingredient in the making of a Vietnamese noodle soup. It is used as a spice in preparation of Biryani in Andhra Pradesh a state of southern India. In Marathi it is called BarDan which literally means "spice with twelve seeds. Star Anise is recognised as a Diuretic odontalgic stimulant. The fruit is carminative stimulant and stomachic. It is used primarily to promote digestion and the appetite and to relieve flatulence. It also makes a good additive to other medicines to improve their taste.